Here are the befores: a paper plate holder, a wooden vase and an over the sink shelf, purchased last Saturday at a church rummage sale. Also a Hickory Farms cheese cutting board from a thrift shop. I painted both sides but stenciled on the side without the logo. And this is kind of a middle, as I had already given this thrift shop shelf a coat of black paint. The paper plate holder and over the sink shelf were painted with Waverly Mineral Paint in Mink from Walmart. The vase was painted with Decoart Americana Chalky Paint in Heritage. The small shelf and Hickory Farms cutting board were painted with Annie Sloan Chalk Paint in French Linen. The pieces were distressed with 220 grit sandpaper. I needed something to cover up the cutesy country heart cut out. This is a Mason Jar wooden craft tag that I painted in black craft paint, stenciled with a fleur d'lis stencil and distressed. 1. Grocery - Decorcal 4" letter stencil packet individual letters taped to together with blue painters tape. I purchased the stencils at Menards but are available at Amazon as well. 2. Cafe de Paris and Fleur d'lis - two Decoart Stencils available at craft stores and Amazon. 3. Lattice and Vin Amour - the lattice pattern on the Hickory Farms cutting board is a Heidi Swapp 12 x 12 stencil in the circle pattern and the Vin Amour is from a Decoart French word stencil also available at craft shops and on Amazon. 4. Vase Flower - Plaid Floral Icons stencils from Walmart. All pieces were protected with Decoart Creme Water Based Wax or Fusion Mineral Paint Tough Coat. So now for the after photos! This is the "Everyday China" paper plate holder. Here is the Hickory Farms cutting board, the over the sink shelf (that could be used on a kitchen counter instead of over the sink), a small cutting board, and the half round shelf. 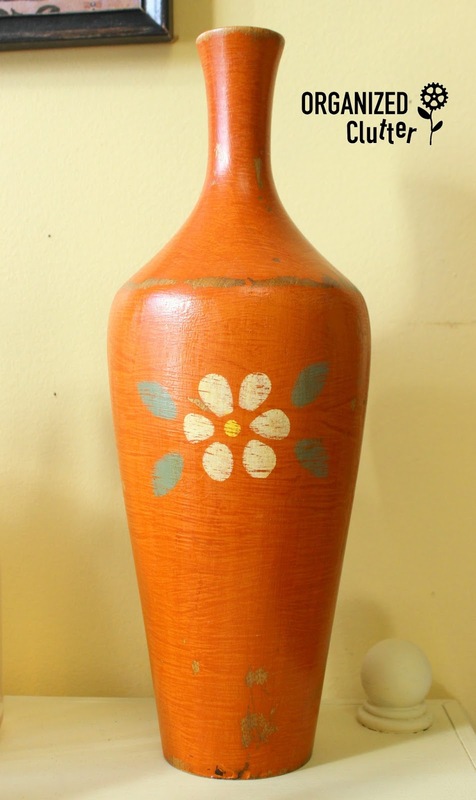 This is the orange wooden vase with Plaid Floral Icons stencil. 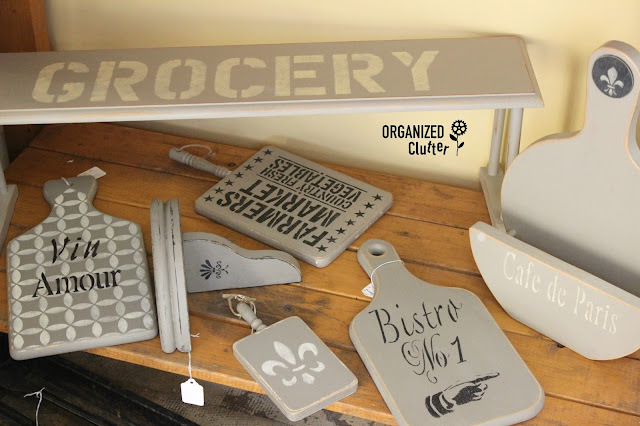 French or farmhouse style with paint, stencils and inexpensive second hand finds. Great job on all of your thrifty makeovers. I'm inspired to hit the thrift stores and yard sales. You have just the right touch to make "Before" items into remarkable "Afters"! Carlene you are always to clever with your upcycles, these look wonderful!